Beer two at the slutitorium. 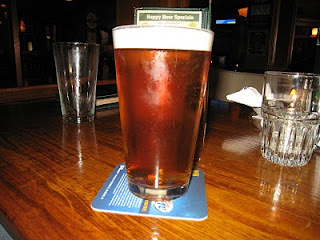 Boddingtons is a classic beer that I think has gotten a little worse as of late, i.e. when InBev bought it. This is a creamy beer, and that is truly the defining characteristic of it. It can be a bit overpowering on the hops, and it is to the point where I can't pick any other flavors out of it. If it weren't for the head, I probably would have dumped this beer a long time ago. The funny thing is every time I order this beer it tastes more and more like cardboard. Either my palate has changed, or they are intentionally letting this beer become stale.